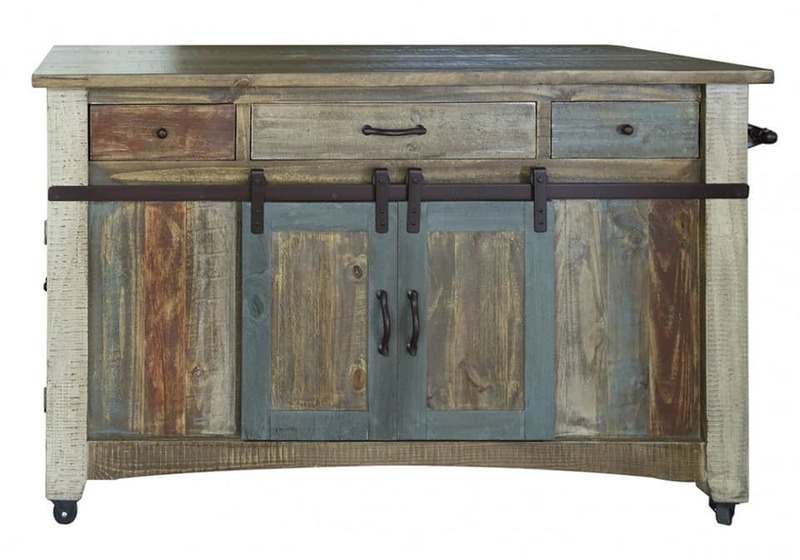 Add function and style to your dining space with this solid wood kitchen island. 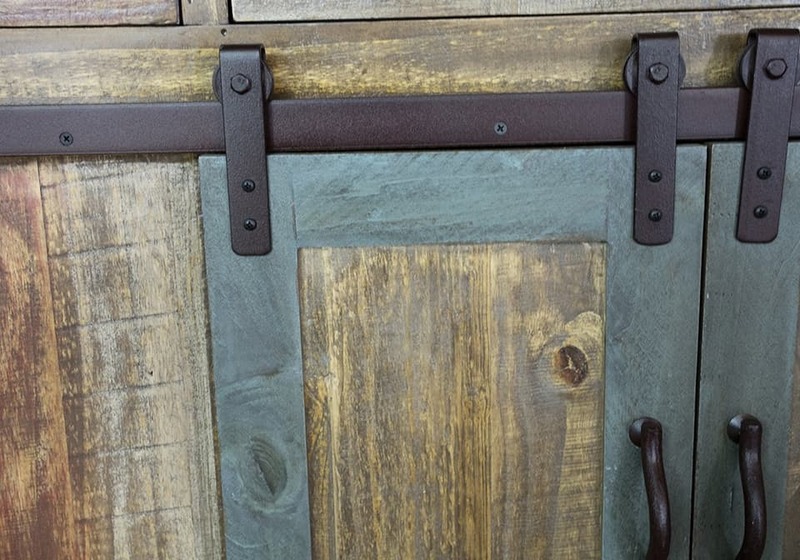 The rustic style provided by the finish choices, barn doors, and metal accents creates a piece that will make a striking addition to your home. Three drawers, two barn doors that open to reveal a fixed shelf, and mesh doors on either side of the piece offer up more than enough storage for dishes or items you may need to help throw together a home cooked meal. The towel hanger provides a convenient space for you to hand a towel or apron, while the overhung top on one side a perfect counter height meal server. 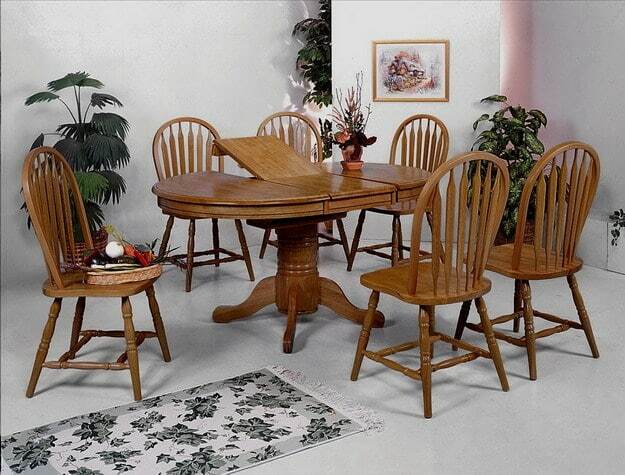 There is something for every home in this unique collection. Everything from bedroom to occasional to dining this collection encompasses it all. Expertly crafted from solid pine and poplar each piece is hand finished with distressing and wire brushing in multiple colors to create an antiqued look. 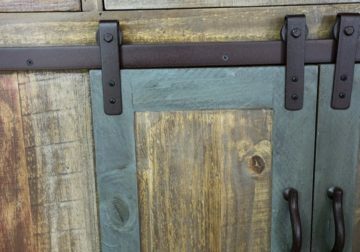 Hand forged iron hardware and accents are also used throughout the collection to a rustic charm to each piece. 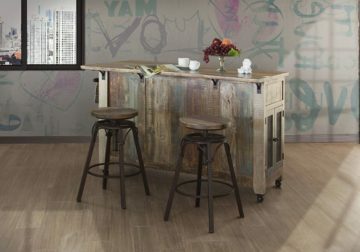 This collection will give your home a country inspired influence and create that cozy environment you are striving to achieve. All finishes and other parts, components, and other furniture products, including but not limited to dining room tables, chairs, occasional tables, beds, dressers, marble tops, granite tops, desks, curio cabinets, china cabinets, buffets, entertainment centers, lamps, electrical components, and handles incorporated into any furniture product, are warranted by the manufacturer to you, the original retail purchaser, for one year from the date of purchase, to be free from material manufacturing defects. The manufacturer will pay, within one year from the date of purchase, reasonable and customary labor rates to repair or replace the defective parts and shipping costs from the retailer to and from factory, or a repair center designated by the manufacturer’s customer service department at no charge to the original retail purchaser. PICKUP: If you choose to pickup your order, pickup is available during our Weekend Warehouse sale hours (Friday-Monday). We are closed to the public for pickups Tuesday through Thursday. NATIONAL SHIPPING: If you live outside of our local delivery zone, we offer national curbside-only shipping for all items on our national website, Local Overstock Warehouse. Most items on our site exceed the size and weight limits of carriers like UPS and FedEx, so transporting these shipments requires the use of large freight companies. We currently do not offer in-home, white glove delivery service; the customer would be responsible for carrying the items indoors. National curbside shipping rates will vary depending on the items purchased and the shipping address. You will receive a specific quote on the checkout page once you’ve added products to your shopping cart. Proudly owned and operated by our Factory owners, IFD is committed to quality and service. 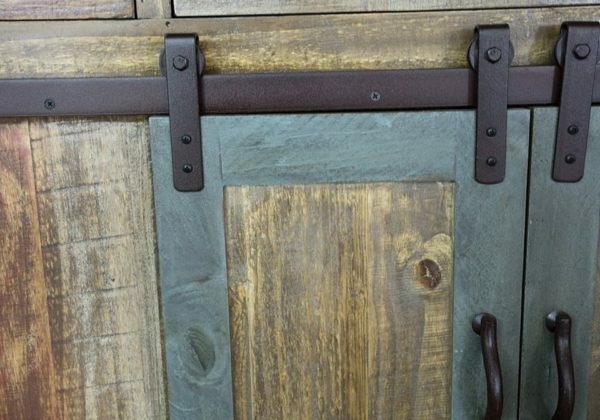 Our unique style is characterized by the variety of materials we use, such as wrought iron, real copper and zinc, and exotic woods including mango and parota wood. All our pieces feature mortise and tenon joinery on solid wood frames, solid wood drawers, ball bearing glides (bedroom collections), and special features like microfiber lining on top drawers of bedroom case-pieces. With an experienced operation specialized in hand-crafted, old-world looks, you can make sure you are obtaining the best value in hand-crafted, unique pieces.